18 months ago, a sub-station stood where the lovely and light Parade tea rooms now serves rich coffee and moreish doorstop cake. The owner, Mark Hogan, turned the run-down and neglected building into the perfect little café with wooden floors, cushions and large windows that overlook the vibrant green of the common. It may be a tad cramped but it’s the best form of upcycling I have seen. 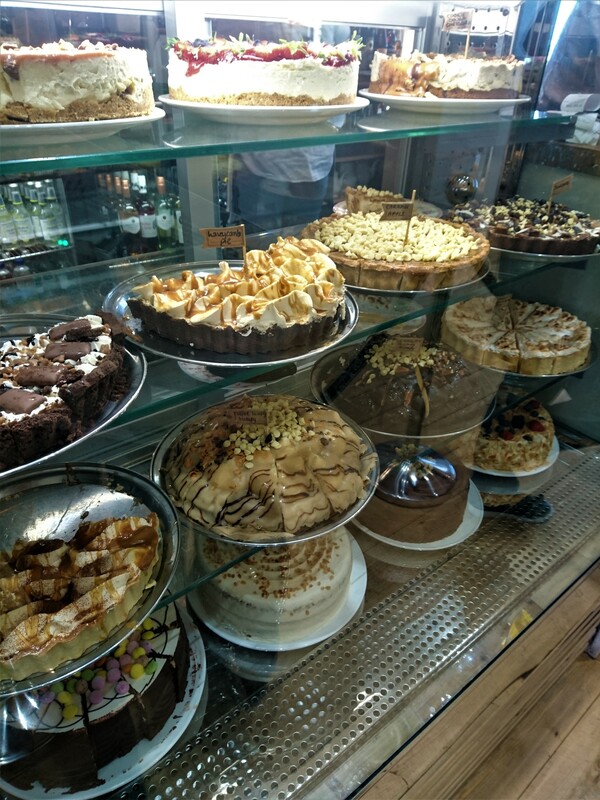 When you enter, a member of staff hands you a menu with a beaming smile and takes you past the kaleidoscopic array of cakes to your seat. This for me was by the large back window where the sun seeped in and made everything gold. Argue all you want it’s not spring, it’s summer. I liked that. Whatever happened between him and the Tenth Hole is another matter but it’s inspiring to see someone work so hard for their aspirations. Although I did find the parallels quite amusing. The Tenth Hole is located on Eastern Parade and The Parade Tea Rooms can be found on Western Parade. Coincidence? The menu is a typical lunch menu with sandwiches, salads and jacket potatoes. Plenty to choose from. They even do an afternoon tea at £25 for two people, although that is only available for an hour a day. Cakes are also reasonable in cost but sandwiches are a little pricey at around £7. A bit sceptical, I went to the till and ordered a tea and a Parade Club sandwich. Again, the member of staff was friendly and enthusiastic. I sat back down and had a good look at the place. It was homely and cosy and everyone seemed to be enjoying themselves, laughing and chatting between mouthfuls. I spied some of their meals and I was gobsmacked. They were huge, to say the least. Giant bowls and plates were being carried to customers who stared at them with open mouths. The salads were the most impressive. They consisted of heaps of lettuce leaves, tomatoes and cucumbers but that wasn’t what took my eye. You would expect that of a salad, but what about sweetcorn, beetroot, blackberries and grapes? Some even had potatoes and bacon on. Who said salads were boring? My sandwich came and I let my jaw drop like everyone else’s. It had layers of thick cut bread and, inside, was a plentiful helping of chicken and bacon. There was a hint of mustard too which was a welcome surprise and the side salad I got with it was hardly just for the side. Rather than a handful of leaves, I was given a bowl of lettuce, tomato, cucumber, beetroot AND coleslaw. Best side salad I have seen although the lack of dressing was a bit disappointing. Does that make me ungrateful? I sound like a child at Christmas who was given a bike, three pairs of socks, a ten-pound gift voucher, an Xbox and a satsuma but complains anyway because they weren’t given the pair of roller skates they asked for. I only managed to eat half before my belly reached its limit. I did seem weary of the prices but the generous portions and flavours are worth the little extra. But the mains aren’t the most important part – the cakes are. With a full stomach, in an act of masochism almost, I went to the till again and stared at the piles of treats. They were all so colourful with different fillings and flavours from Waffle Brownie to Bread Pudding. Just staring at them tantalised my senses; my mouth watered, imagining how each one tasted and trying to decide which one to try. An important decision with too much choice. I bought two. I got the millionaire’s shortbread and a cookie dough cheesecake. They were big fat slices and slapped against the plate as the waitress served them. The cheesecake oozed with caramel and chocolate and compared to it, the plate looked pathetic. It was sickly and gooey with sweetness to start and crunch to finish. The millionaire’s shortbread was thick with a soft, crumbly bottom and a white and milk chocolate top. With the first bite, I felt my eyes roll into the back of my head. Parade Tea Rooms had done it, they had become my top millionaire’s shortbread. There was plenty left over and luckily they had doggy bags at the ready. I took a few for my sandwich and cakes so I could take the party home with me. As I walked out, a long queue had started to form by the door. It got bigger and bigger and I couldn’t imagine what it would be like in the summer. ‘Make sure to come earlier’ I advised myself. Parade Tea Rooms is a wonderful place to enjoy great food and gorge on gooey, syrupy, creamy cake. The prices are bit higher than average but the large portions make it worth your while. Why not visit to gaze out at the common, on a sunny day, and realise why people celebrate Southsea so much?